In celebration of both Nicola Cornick’s latest release, The Last Rake in London, and Mills & Boon’s 100th anniversary, I was delighted to have the opportunity to conduct and interview with this talented author. Nicola was born in Yorkshire and spent the first eighteen years of her life there. She credits these early years with having a formative effect on her writers’ imagination in several ways. Firstly she went to school in the eighteenth century dower house that once belonged to the Earls of Harewood. In such auspicious surroundings her love of history and writing flourished, encouraged by some wonderful teachers. She also spent hours walking on the moors that inspired the Brontes and devoured a diet of costume dramas and historical novels. It was during this time that she developed a love of choral music and sang with various choirs that toured the UK and Europe. In 2006 Nicola was awarded a Masters degree with distinction in Public History at Ruskin College, Oxford for her dissertation on heroes. She is currently researching the history of the National Trust property Ashdown House, in Oxfordshire, where she works as a guide. She also works in a second hand bookshop, which is like letting a chocolate addict loose in a sweet shop Her other interests are wildlife and conservation, music, reading and training guide dog puppies. Nicola has written 26 historical romances for Harlequin Mills and Boon and HQN Books. She has been short-listed for the RWA RITA® Award, nominated twice for the RNA Romance Prize and Romantic Times Reviewer’s Choice awards, and has won the LORIES Award of Excellence. Let’s start by getting to know you better. I notice on your website that you work for Ashdown House (I’m green with envy). Care to share the background of the home and your work? How has your work in the manor home influenced your writing? Thank you very much for inviting me to talk to you today and also for asking about Ashdown House! It is one of the great passions of my life, along with my writing and my family (not necessarily in that order!) 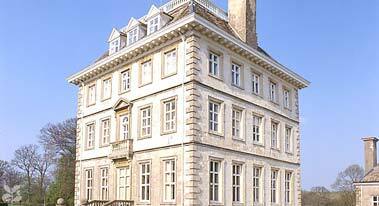 Ashdown was built in the seventeenth century by the chivalrous and heroic cavalier William, First Earl of Craven. He was a loyal supporter of Elizabeth of Bohemia, the Winter Queen, and he intended the house to be a home for her but sadly she died before it was completed. She left her portrait collection to William Craven as a thank you for the devoted service he had given to her. It is an amazing experience for me to be able to show visitors around the house and the portrait collection, and to talk to them about the Craven family. One of the later Earls of Craven married Cornelia Martin, an American heiress. She was only sixteen years old when they met and they had a sumptuous wedding in New York. The Cravens had started out as a fabulously wealthy family, the third richest in England, but by the end of the nineteenth century, when the marriage took place, they were heavily mortgaged. Cornelia transformed the family fortunes and also transformed the Craven mansion houses and their grounds with her money and immaculate taste and style. I would love to write her story one day. Working at Ashdown has been inspirational for my writing. The history of the house and the era in which it was built fascinate me. I set one of my books, Lord Greville’s Captive, during the English Civil War. One of my favourite occupations is visiting historic houses and soaking up the atmosphere. I always come away bubbling with ideas for stories! Though the majority of historical romance is set in 19th century Britain, the genre is dominated by American writers. What has been your experience as a British writer of British-set historical romance? It wasn’t until I was published in the US that I realised how popular the Regency genre was with US and readers and authors. As a reader it was a marvellous discovery for me as I had run through all the UK-published regencies and was desperate for more. You can imagine how excited I felt on discovering such a thriving Regency historical romance genre in the US! The quality of the writing is so high and there is an energy and excitement about US-published historicals that I find makes them huge fun to read. As a British writer I think it’s true to say that the US is a very difficult market to break into because the competition is so tough and the standard of the writing so high. I think I have been very, very fortunate to be published in the US as well as the UK and to be able to build up a readership that seems to enjoy my “English voice” and get my sense of humour! These days I do think that the UK and US markets have moved much closer together, the US books are available in the UK via the internet and the two readerships talk to each other a lot more on internet loops and groups. For those unfamiliar with your work, how would you describe your novels? I’d say they are intensely emotional and pretty hot historicals! What are some of the themes that draw you to historical romance? Mmm, that’s an interesting one. I’m not sure that I was consciously aware of any themes drawing me in when I started writing. It was such an instinctive thing and I didn’t stop to analyse it. Later on I became fascinated by similarities and differences throughout history. I like exploring whether human emotions are universal, regardless of the age and place we live. I also like looking at themes such as celebrity, which sound so modern and yet have parallels throughout history. In Lord of Scandal, for example, I was looking at the cult of celebrity in the Regency period and in The Earl’s Prize I explored what it might be like to be a Regency lottery winner. What authors and/or books have inspired you to be the writer you are today? Gosh, where do I start? There are so many wonderful authors whose writing I have found inspirational since I was a child. My all time favourites are Jane Austen, Dodie Smith and Robert Neill, whose wonderful historical Mist Over Pendle was hugely influential on me when I was in my teens and is still on my keeper shelf. I also went through a period of devouring time shift novels: Barbara Erskine and James Long (whose book Ferney is one of the best timeshift books ever in my opinion) and Susanna Kearsley. In terms of Regency romance, is there anyone who comes to reading or writing that without being inspired by Georgette Heyer? Devil’s Cub and The Talisman Ring remain my favourites, up against some pretty stiff competition! Alice Chetwynd Ley was an author whose Regencies I discovered in the 1970s and whose books I still adore. I’d better stop there – I think I could talk endlessly about the authors who have inspired me! What made you accept the offer to write a novel set in 1908 for Mills and Boon’s 100th anniversary? I was intrigued and also rather apprehensive when Mills & Boon asked me to write a book set in 1908 as part of their centenary celebrations. I had never set a book in that era before and it was also a very long time since I had studied the Edwardian period so I wasn’t 100% sure I was qualified to do the job! In the end I accepted because I thought I would enjoy the stimulation of writing a book set in a different era and also because I had a very personal connection with 1908; my grandmother, who died earlier this year, would have celebrated her 100th birthday last month so 1908 was “her” year too. I’ve been studying the Edwardian era for the past five years, and still find new things every day that fascinate me. As you researched The Last Rake in London, what were some things that caught your attention? I think that the thing that struck me very hard was that some aspects of the society and culture seemed very modern and familiar whilst others seemed utterly alien and divided from the present by an enormous gulf of years and experience. Technology was further advanced than I had realised – I was astonished to discover, for example, that some of the London Underground was up and running and that it was already called “The Tube” as it is today. The other thing that fascinated me was the fight for women’s suffrage, which I had studied a little as part of my MA course at Ruskin College, Oxford. I am someone who believes in exercising her right to vote but when I was reminded of the struggle my forbears had gone through to gain me that right, it was very humbling. Did you find any similarities between the Regency era and the Edwardian era? The more I read up on the Edwardian period, the more similarities I noticed. Both eras are known for the dazzling opulence of high society, the lavish country house parties and the glittering London Season but beneath that seethes layers of poverty and violence and deprivation. In both cases the extremes of affluence and poverty were very marked. I think that the more you study it, the more the parallels become apparent. What resources did you find most helpful for this period? I started off by watching some costume dramas set in the period, such as the Duchess of Duke Street and Upstairs Downstairs. I felt that would get me into the right mindset and give me a feel for the period. It was great to rediscover those series as they were programmes I had enjoyed in my youth. I also drew on my memories of some of the National Trust properties that I had visited that had Edwardian interiors, such as Lindisfarne Castle, which although it was originally a Tudor fortress was redesigned by Lutyens in 1903. Only to thank you very much for inviting me to blog on Edwardian Promenade and to say that I wish I had found the site before I wrote the book. It’s fascinating and I’ll be returning often. Thank you! 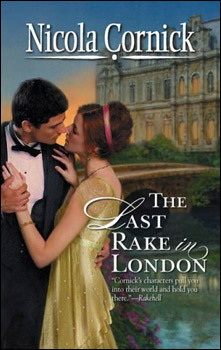 The Last Rake of London can be purchased from amazon, and from eharlequin. I love your website and of course the period. As an English professor in an American University I’m constantly having to explain the difference between Victorian and Edwardian. I teach a course called Daughters of Decadence which is really an Edwardian course (though I cheat a little by putting Emily Dickinson into it since her first vilume of poems came out 1890.) My new book American Eve is about the twilight of the era and Evelyn Nesbit, who embodied all the paradoxes of an era. If I knew how to attach a photo her I would but I really am stuck in the 19th century in many ways! Fabulous interview! I’m looking forward to my copy of The Last Rake in London. And how interesting, Nicola, that you get to spend time in a wonderful house like Ashdown. Good one, Nicola! Great interview, interesting factoids. But you’re not giving up on the Regency, are you? Ooh I am extremely late to the party here (About a year and a half late!). But I loved reading this interview. 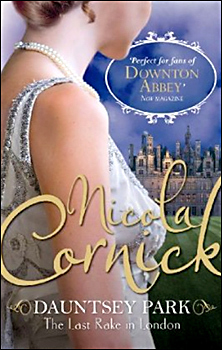 I have recently gotten into reading Nicola Cornick’s books. Also, I have been going crazy looking for sources on the Edwardian Era. All I find, for the most part, are Victorian Era resources. So TY Evangeline for archiving this interview. I just ordered those reference books Nicola mentions from Amazon. Well, just ordered two of them, as I had already ordered one of them a few days back. Good to know I made the right choice on that one. Hey Georgie, did you catch my bibliography? I have it listed on this site here.